Songs 1st show: Foxy Lady; Fire; The Burning Of The Midnight Lamp; a.o. Songs 2nd show: Sergeant Pepper's Lonely Hearts Club Band; Hey Joe; The Burning Of The Midnight Lamp; Wild Thing ; a.o. Both shows attracted almost 8,000 people, a record for the venue. 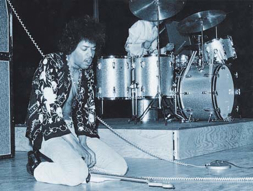 Jimi: "I like the Swedes. They sit still and listen to my music and I believe they understand it."